Pictured NIC student members of Business Professionals of America, Malinda Becker, left, and Lisa Reed, attending that organization’s national conference in Orlando, Fla., recently. The two students and their advisor, Tacey Keylon, took home several honors and awards from the event. 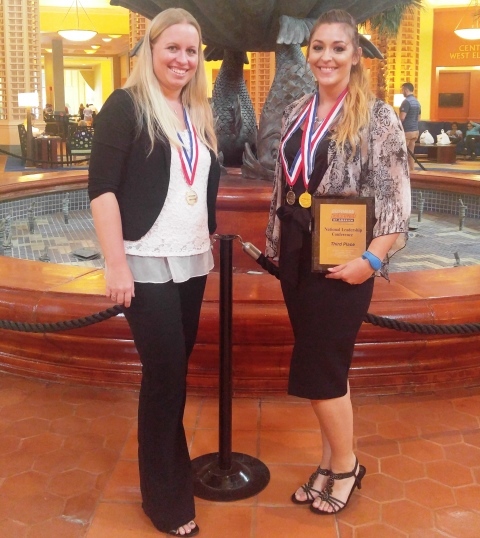 Two North Idaho College student members of Business Professionals of America won several awards and an NIC advisor was honored at the 2017 BPA National Leadership Conference held in Orlando in May. BPA is a national organization for high school and college students preparing for careers in business and technical fields. “The conference is the culmination of a school year’s worth of business and administrative services training, which members of the local chapter of Business Professionals of America at North Idaho College have received in our Administrative Assistant program,” said Tacey Keylon, NIC BPA Chapter advisor and Administrative Services program manager. Lisa Reed, of Mullan, and Malinda Becker, of Hayden, placed in BPA state competitions in March to qualify for the national “Spread Your Wings” competition. Reed earned a third-place finish in the Integrated Office Applications event, fifth place in the Basic Office Systems and Procedures event, 14th place in the College Payroll Accounting event, the Local Certified Member Award and the Life Skills Achievement Award. Becker earned a seventh-place finish in the Desktop Publishing event and finished 15th in the Fundamental Word Processing event. Tacey Keylon was recognized as an Honor Advisor for her 20 years of service, earned the Local Certified Advisor Award, earned the Life Skills Achievement Award and was recognized as a BPA Merit Scholar. Business Professionals of America is a national organization for high school, college and middle school students preparing for careers in business and information technology occupations. The organization’s activities and programs complement classroom instruction by giving students practical experience through application of the skills learned at school. NIC integrated BPA into the program by having NIC Computer Applications and Office Technologies courses use the BPA Style and Reference Manual as the course document formatting guidelines for their course assignments. Students learn how to use a reference manual for formatting documents as well as practicing the skills BPA will assess in their competitions. BPA alumni stay involved in the organization by sitting on the NIC Administrative Services Advisory Committee once they are established in careers. The NIC BPA Chapter also gives back to the community by coordinating and hosting the Region 1 Secondary BPA Conference as a service project/fundraiser for the chapter.